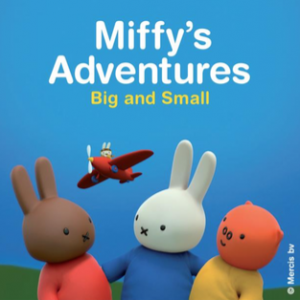 You’ll be able to hear me as the Narrator on Miffy’s Adventures Big and Small from 2nd October on Tiny Pop. I also wrote three episodes! Very exciting for me as Miffy is the first book I ever remember reading at the library (Balham, in case you’re wondering, on Boundaries Road. There’s an astroturf pitch there now. )After launching on Freeview channel 126 in January this year Tiny Pop became available in 26.3 million homes. It has since more than doubled its ratings to become the third strongest channel overall for Kids 4-6, after CBeebies and Disney Junior.